Today, I’m giving you a bit of history/economics. 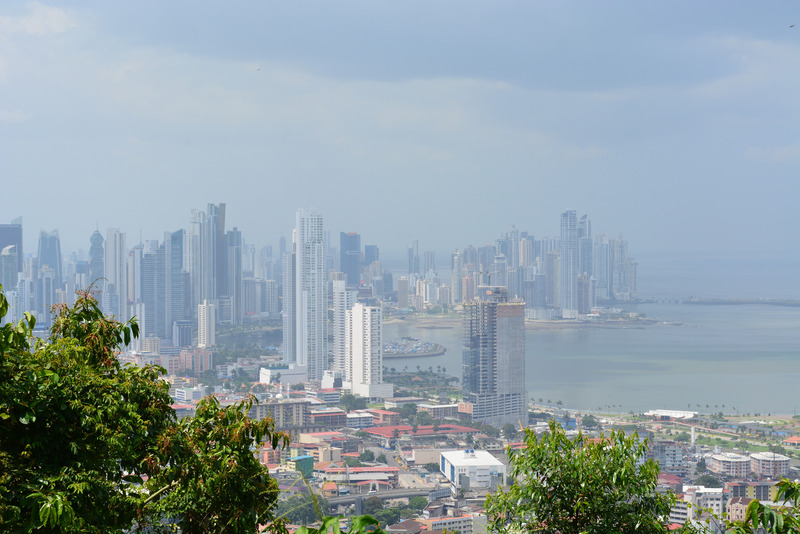 When one travels to Panamá, after feeling the heat, the first obvious thing you can tell just by looking at the capital city is that… there’s money here. I’m not saying it’s well distributed. I don’t deny the existence of poverty in Panamá (30% of the population lives in poverty). I’m not praising the social security network of Panamá either. But, seeing all those brand new buildings, some of which are actually real architectural marvels, and all those busy construction sites tells you that something is happening. Once you travel the city and country, you realise that… main roads are fantastic and city buses are modern and air-conditioned. There is even an air-conditioned metro which opened this spring and where trains pass every 3-5 minutes at any time of the day (shame to Montreal on that one). When you realise the number of cops around the country (literally one at every corner, and even in the smallest villages), you also wonder who pays their salary. Search no further… it’s coming from the Canal. 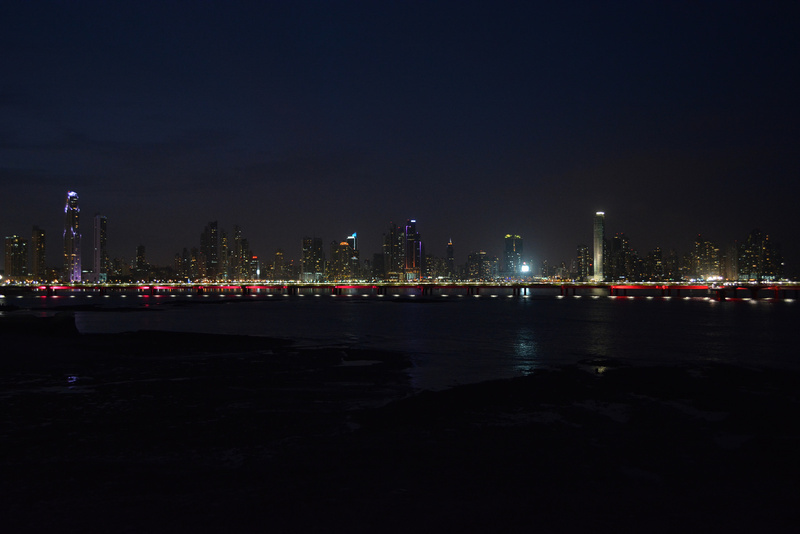 Panamá City definitely looks like a modern capital, and it is. The city has been a hub of international commerce from the times when the gold of Peru and Ecuador stopped here before reaching Spain, until recent years when the Panamá Canal became one of the obligate passageways for our globalized economy (Photos: Nicolas Chatel-Launay). The first mention we have of anyone hoping to build a canal crossing the Isthmus of Panamá is from 1534, thanks to Charles V, King of Spain and Ruler of the Holy Roman Empire. The Scots also tried to build a land road joining the Atlantic and Pacific in 1698. Scotland almost went bankrupt with this failed attempt, and ended up joining the United Kingdom that promised to erase the national debt in exchange. Yup, the independence referendum that will be held soon in Scotland is the newest chapter of a story which began as a failed colonial attempt in Panamá. It’s a small, small world. In 1882, the French had successfully built the Suez Canal joining the Red Sea to the Mediterranean in Egypt. Ferdinand de Lesseps, builder of the Suez Canal, went on to found the Compagnie universelle du canal interocéanique de Panama to repeat the feat and join the Atlantic to the Pacific. And, lo, yellow fever and the floods of the Chagres River came. Gustave Eiffel (yes, the guy that built the Eiffel Tower) tried to save the project. Yet, in 1889, the company went bankrupt and the unfinished canal was abandoned. 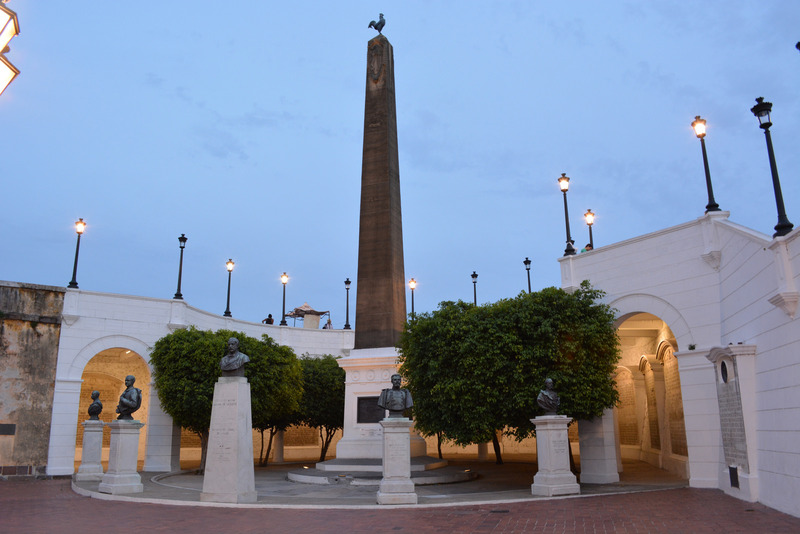 To recognize the efforts of the French government in building the canal and in honour of the friendship between the French Republic and the Republic of Panamá, the Panamanian government built this majestic monument in front of the French Embassy, on Plaza de Francia. 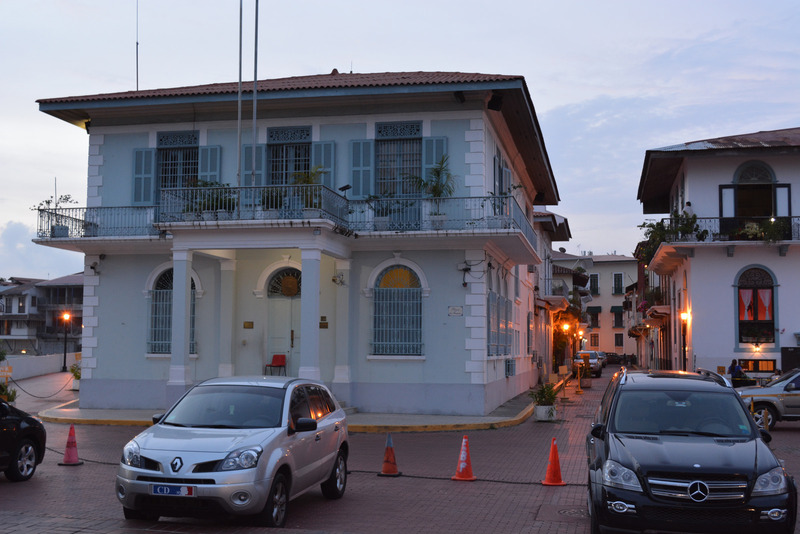 The lower picture shows the main building of the French Embassy (Photos: Nicolas Chatel-Launay). In 1903, the Columbian government (Panamá was a Columbian province at the time) and the United States government came to an agreement on a new canal project, but the Columbian Senate refused to ratify it. Because he really wanted the canal, U.S. President Roosevelt sent warships to help the effort of Panamanian revolutionaries against Columbia and, on November 3 1903, Panamá declared its independence. It will not be the last time the U.S. puts its nose in Panamanian politics. Upon securing its independence, Panamá gave to the United States of America the Panama Canal Zone. The Canal Zone was an unincorporated organized U.S. territory (just like Puerto Rico and The U.S. Virgin Islands are today) extending 5 miles (8 km) on each side of the canal and protected by the U.S. military. Under U.S. jurisdiction, the Canal finally opened on August 15 1914, almost exactly 100 years ago. 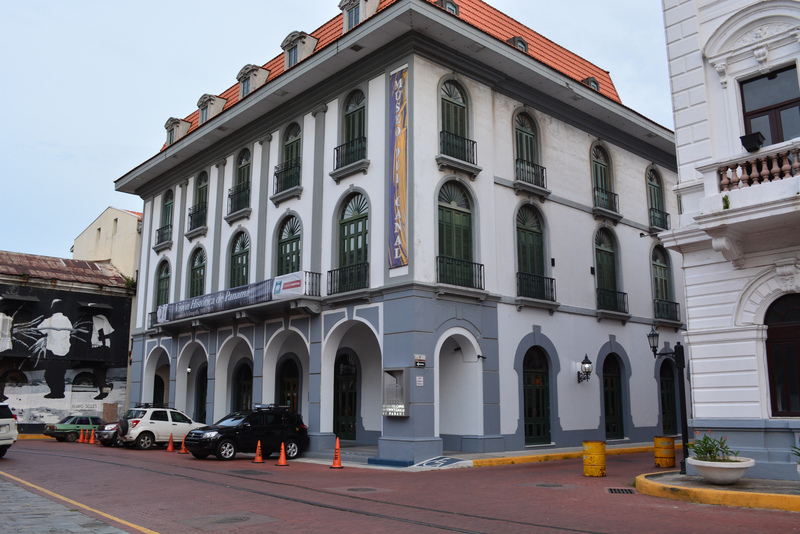 For those interested in history, the Autoridad del Canal de Panamá maintains a rather interesting history museum in Casco Viejo, the Museo del Canal. It covers the history of the country and of the canal from the first expedition across the Isthmus by Vasco Nuñez de Balboa in 1513 to the present (Photo: Nicolas Chatel-Launay). I will spare you the long list of treaties, political conflicts and demonstrations that followed the opening of the Canal. You need only know that until 1979, the Canal Zone was a U.S. territory, where residents were U.S. citizens, courts applied U.S. laws, and all retail stores and houses belonged to the Panama Canal Zone that functioned as an all-powerful company who’s president was also the Governor of the Canal Zone. Fun fact, John McCain who ran against Obama in 2008 was born in 1936 as a U.S. citizen in… the Panama Canal Zone. Because you need to be born in the U.S. to become president, people brought it to court, and McCain was ruled by the U.S. Senate as a “Naturally Born U.S. Citizen”. The Smithsonian Tropical Research Institute (STRI) where I work, as well as my apartment, are both located in Ancón, a former township of the Canal Zone which was U.S. territory at the time of STRI’s creation. In 1979, the Torrijos-Carter Treaty came in effect. The Canal Zone progressively became Panamanian soil for the first time (remember, it was Columbian soil before being American). It is interesting to note that General Omar Torrijos came to power in Panamá through a military coup. Even after the treaty, the Canal was still managed by a joint commission, and the United States maintained the right to defend the canal militarily if anything impaired the neutral crossing of ships from around the world. In December 1989, U.S. President George H. W. Bush used the option, and the United States military invaded Panamá during “Operation Just Cause”. They deposed the dictator of the time, General Manuel Noriega, and retreated from Panamá only after Guillermo Endara (the elected President) was sworn into office in January 1990. Panamá has been a democracy ever since (although the press is still somewhat restricted). Considering the amount of dictators of Panamá that came from the military, it was decided in 1994 to abolish the Army of Panamá. That’s why one will see some policemen walking around in military attire with what is definitely military weapons. The police fills the role of the army. So don’t mess with cops in Panamá. 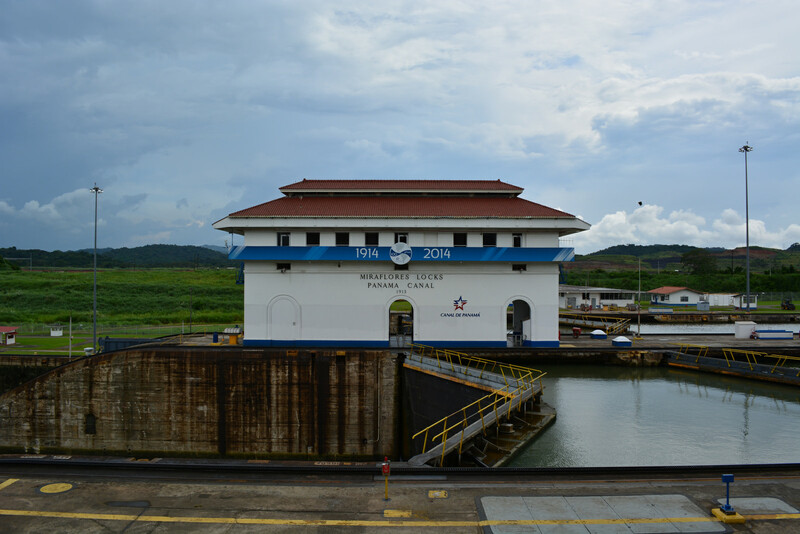 To finish the story-line, on January 1st 2000, the Panamá Canal Commission relinquished all powers over the canal to the Panamanian government. For the first time, and a good way to welcome the new millennium, the flag of the Republic of Panamá could fly proudly in front of the old Canal Zone Administration Building. It is now administered by the Autoridad del Canal de Panamá and defended by the Policia Nacional, two fully Panamanian public administrations. 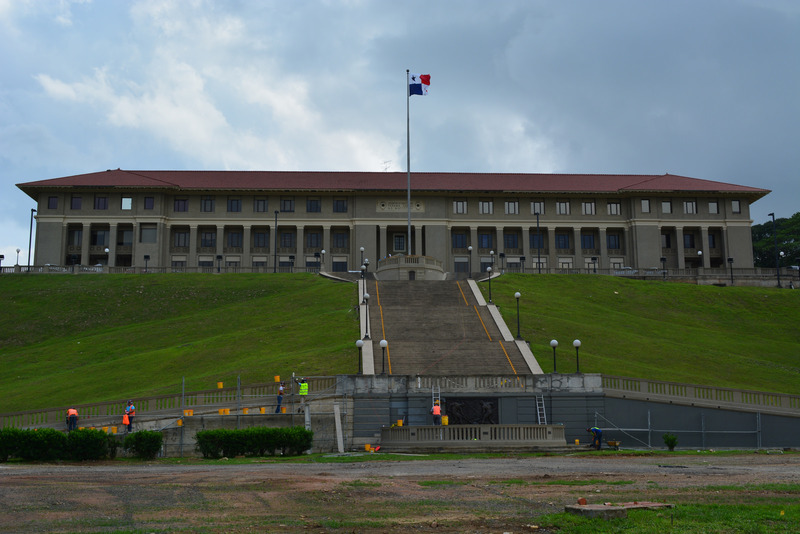 The headquarters of the Autoridad del Canal de Panamá (formerly the headquarters of the Canal Zone Administration) on the slopes of Ancón hill. Before 2000, the flag of the United States of America was flown atop the mast (Photo: Nicolas Chatel-Launay). A view of the Miraflores Locks, the first locks to be crossed when coming from the Pacific and the last in the opposite direction (Photo: Nicolas Chatel-Launay). 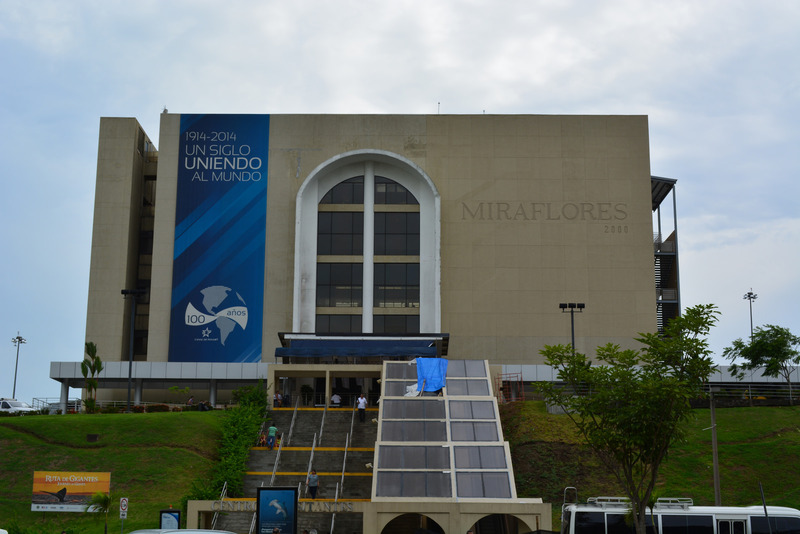 The Miraflores Locks are a popular tourist attraction. There’s a museum and higher decks allow tourists to watch the operations of the canal and observe ships in transit (Photo: Nicolas Chatel-Launay). To cross the Canal, boats have to pay a fee that is calculated based on the size of the ship and on the cargo it transports. Leisure boats are welcome to use the canal as well. The fee is than calculated based on boat size and the number of passengers it can carry. The lowest toll ever paid to cross the canal was 36 cents when Richard Halliburton swam the Canal in 1928. Yes, even humans in swimsuits have to pay the toll. The most expensive toll was $375,600 for the passage of the cruise ship Norwegian Pearl. For obvious reasons, ships registered in Panamá pay lower fees. Because of this, many companies from abroad register their ships in Panamá. It’s called a flag of convenience. So if you ever see a boat stopping by the Port of Montreal with a Panamanian flag on it, it probably doesn’t belong to a Panamanian company. If you pass by the port this weekend, the MSC Sandra, a Panamanian ship that is actually British, is currently stationed in Montreal until Sunday morning (July 27th). 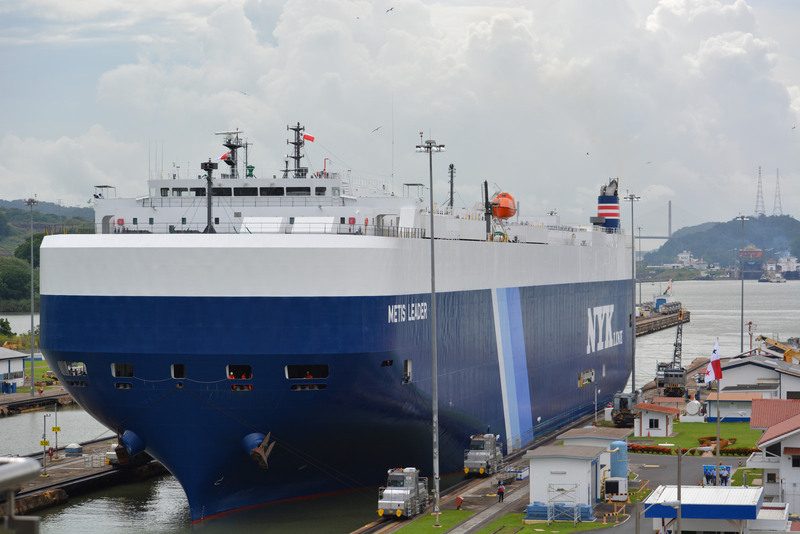 When I visited the Miraflores Locks, the Metis Leader, a car transport ship with a capacity of 7,000 vehicles and belonging to NYK Line, was crossing towards the Pacific on its way back to Japan. Although this ship is actually Japanese, it is registered in Panamá and sports a Panamanian flag of convenience. Note the electric mules on both sides (the small locomotives) that pull the ship in the locks to avoid it touching the walls. Less than 60 cm separate each side of the lock from the ship. That’s what I call precision (Photo: Nicolas Chatel-Launay). Most of the Panamá Canal is actually one gigantic artificial lake, Gatun Lake. At the center of the lake lies Barro Colorado Island, a STRI-owned island home to one of the greatest scientific experiments on Earth, the CTFS plot (Center for Tropical Forest Science). Imagine a 50 ha forest plot where every single tree, shrub or liana over 1 cm in diameter has been identified to species, measured, located geographically and re-measured every 5 years for nearly 100 years (since 1923). Add to that a century of meteorological data, flower production data, fruit production data, and many other measurements. If you don’t know what 50 ha means, think 80 football fields (yeah Germany!). This is the ultimate dataset to understand forest dynamics in the tropics. I’ll talk more about STRI and all its awesome facilities and research sites in another post. Bringing it back to Gatun Lake, boats travel on the lake 26 meters above sea level. On the Atlantic side, the Gatun Locks rise boats from sea level to 26 meters. On the Pacific side, Pedro Miguel Locks bring boats down to Miraflores Lake, and from there, the Miraflores Locks permit boats to reach the Pacific Ocean. Running all those locks and maintaining the level of Gatun Lake requires huge quantities of fresh water. Most of it comes from the Chagres River and Alajuela Lake. Both are supplied in water by one of Panamá’s biggest natural areas, the Chagres National Park. My butterflies live on the shores of Alajuela Lake, and weirdly enough, their habitat is protected to ensure the smooth operation of the Canal. This is one of those few cases when economic imperatives can actually help protect an area that would be long gone otherwise. Cut down the forest, and not enough water will make it to the watershed, and the Canal will be in trouble. In addition to Chagres Park, most of the Eastern shore of the Canal is a series of interconnected National and Natural Parks. It’s a great place to study biology. A map of the Panama Canal (Map credit: The Canal “Panama Canal Map EN” by Thoroe – Own workMap created using:Generic Mapping Tools (GMT) with SRTM3 V2 dataOpenStreetMap dataFile:CanalZone.gifFile:Panama Canal Rough Diagram.pngProposal for the expansion of the Panama CanalPanama Canal Profile Map. 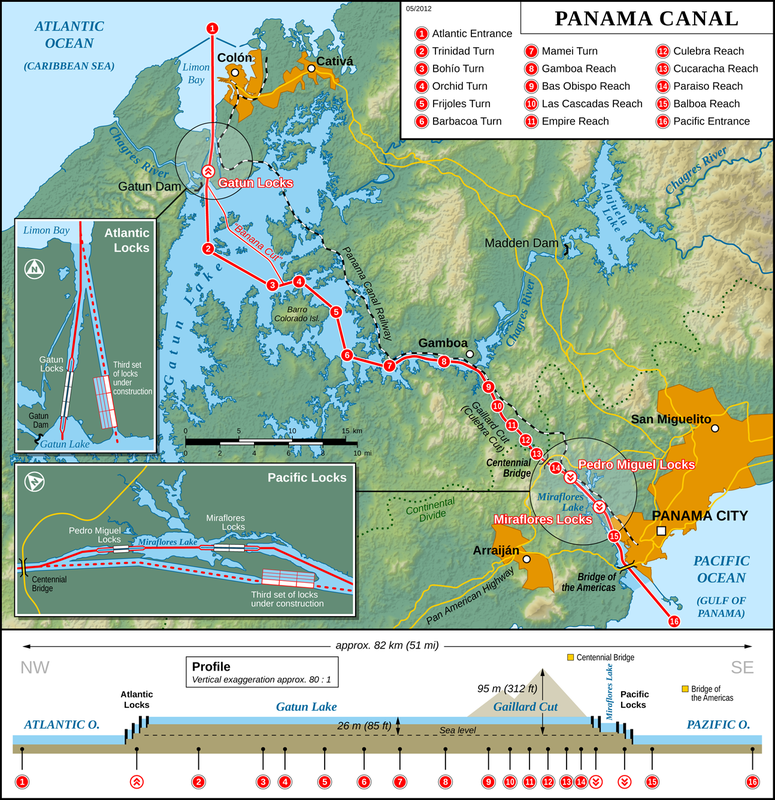 Licensed under Creative Commons Attribution-Share Alike 2.0 via Wikimedia Commons – http://commons.wikimedia.org/wiki/File:Panama_Canal_Map_EN.png#mediaviewer/File:Panama_Canal_Map_EN.png). The Panamá Canal is now a vital part of Panamá’s economy. It is a major sector of employment in the country. All revenues from the Canal are directly given to the Panamá government, hence the new $1.0 billion metro system in Panamá Ciudad. In future years, the Canal will become even more profitable as new wider locks are being built on both sides of Gatun Lake to accommodate even larger ships. That’s only if environmental issues such as climate change and deforestation don’t affect the water reserves that make all this possible. The Republic should really improve its environmental policies if it wants to conserve its good old pot of gold. 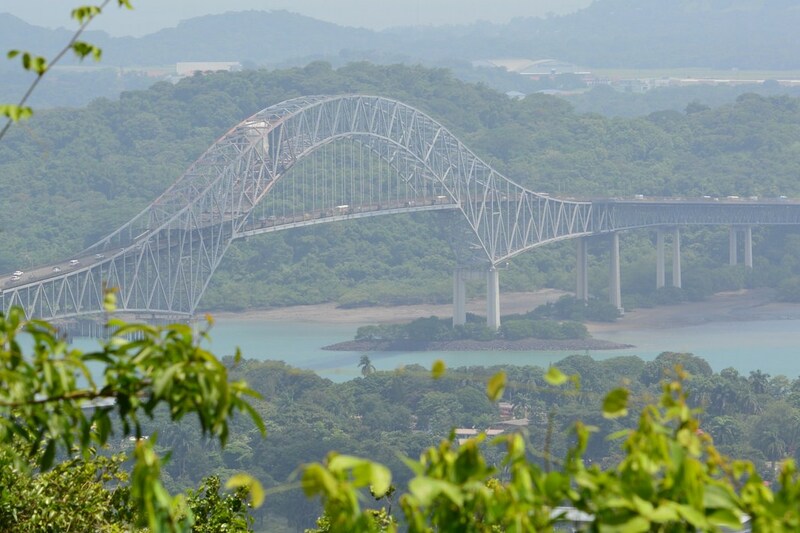 The Bridge of the Americas marks the entrance of the Panamá Canal on the Pacific side (Photo: Nicolas Chatel-Launay). To end this, why not go for more birds. The Canal is home to many seabirds. 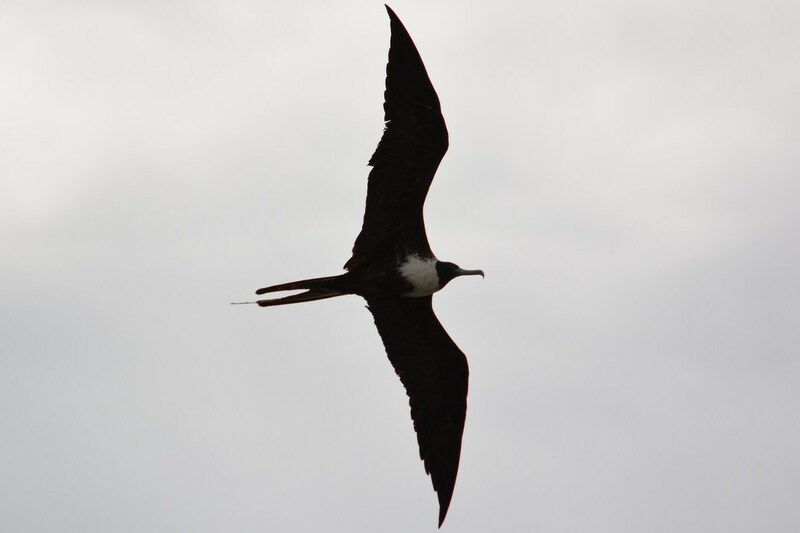 The most impressive and common of them is no doubt the Magnificent Frigatebird (Fregata magnificens). 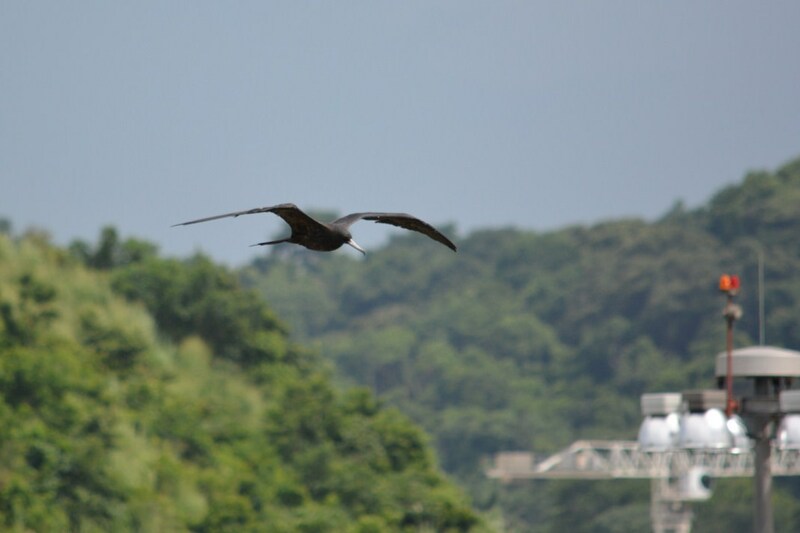 One of the largest birds in Panamá, its body measures 1 meter long and its wingspan reaches 2.15 meters. The bottom one is a male while the female is on top (Photos: Nicolas Chatel-Launay).